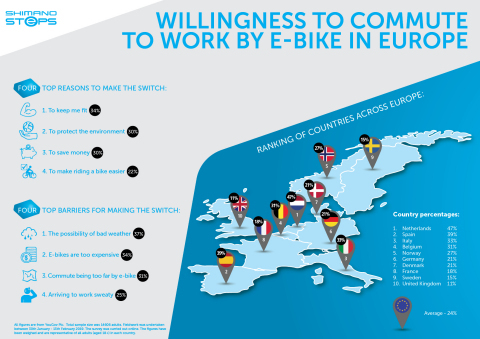 SHIMANO STEPS today reveals the results of the largest European e-bike study looking at people’s willingness to commute to work by e-bike. The independent research* of over 12,000 people across 10 markets, reveals that 24% of European commuters would consider switching to an e-bike. Almost half of the population of the Netherlands (47%) would commute to work by e-bike, the highest in Europe, while 39% of people in Spain and 33% in Italy would make the switch. The SHIMANO STEPS research reveals that across Europe, the main reasons to consider commuting to work by e-bike are “to keep fit” (34%) “to protect the environment” (30%) and “to save money” (30%). People are put off riding an e-bike to work because of “the possibility of bad weather” (37%), “the cost of an e-bike” (34%) and “arriving to work sweaty” (25%). People in the UK are the least likely to choose an e-bike to commute to work, with only 11% willing to consider making the switch, well below the European average. The “possibility of bad weather” (43%) and “arriving to work sweaty” (35%) proved to be the main reasons for the UK public to resist the switch to an e-bike. 1. All figures, unless otherwise stated, are from YouGov Plc. Sample size: 14606 adults. Fieldwork done between 30th January - 13th February 2019. Survey was carried out online. The figures are weighed and represent all adults (aged 18+) in each country. 2. “commuters” refers to people who work.